That with Chris Gayle being held to 22 runs off of 28 balls (a terrible rate for one of the world's best players). That being mostly the same West Indies team that is coming off an embarassing performace against England, in both Test and ODI's. That team being ranked next to last for the 12 teams in the tournament, and have come flying out of the gates ever since. I won't lie, I don't know when the new ICC rankings come out again, but I can tell you one thing, they won't see the West Indies in 11th place, even if they did lose to South Africa just before I started to write this. 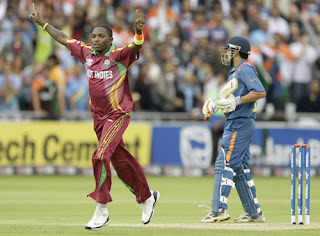 Dwayne Bravo was the star of the show going for 66 runs (anything above 50 is a pretty good effort for 20 overs) as well as bowling four of India's seven wickets. From what I could tell, they were 11th because they finished 11th in the last T20 World Cup. Which seems kind of weird in that they put the teams that had to qualify ahead of them, even the ones that weren't even in the last World Cup. The Windies seem to play well...when they want to play. You actually spoiled it for me--I was hoping to find the game on bittorrent, but they were too slow getting it up there. No worries, though. I know nothing about the sport, yet I'm oddly fascinated by it. The best I could do for you is the video highlights I found (they're what I wanted to embed instead of that picture, but the picture worked just as well). I've been insanely disappointed by the Windies since they spent their Christmas break playing a much more talented New Zealand so evenly, then Chris Gayle decided to retire (or so it seems based on the way he's playing), they get embarassed by England, and limp through group, you've got to expect India to win by like 25 runs. But Dwayne "Top Dawg" Bravo (Thanks CricInfo!) played what has to be the match of the tournament, and now I've got hopes for a semi-final birth. Nah I found it at thebox.bz, great as long as you don't mind waiting about 20 hours and avoid spoilers (not a problem in the US). I just watched the whole match--awesome, especially Bravo. And I don't get Gayle. He absolutely destroyed Australia, but he didn't look with it at all against India.